The weekend we’ve all been waiting for is just a day away. Memorial Day weekend could not have come sooner after the dreaded winter we had here on the East Coast. But with warm weather comes a whole new slew of beauty problems to worry about. And if you’ve got color-treated (or bleached hair in my case), you’re dreading the dried out strands and frizz that come with the hot sun, salt water, chlorine and humidity. Don’t worry, TIGI has got you covered in the most stylish way with the launch of a limited edition collection just for summer hair problems. Consider the Totally Beachin’ Shampoo ($15.99), Conditioner ($16.99), and Beach Bound Protection Spray for Colored Hair ($18.99) your summer hair saviors. The shampoo and conditioner gently cleanse your hair, getting rid of lingering salt and chlorine and leaving your strands soft and shiny. Both are completely color safe and smell like juicy citrus. The protection spray is a beach bag essential. Not only does this magical potion fight against frizz and heat, it’s also got UV filters, antioxidant-rich pink grapefruit extract. Not to mention it targets internal protein bonds to strengthen hair. It gets better. 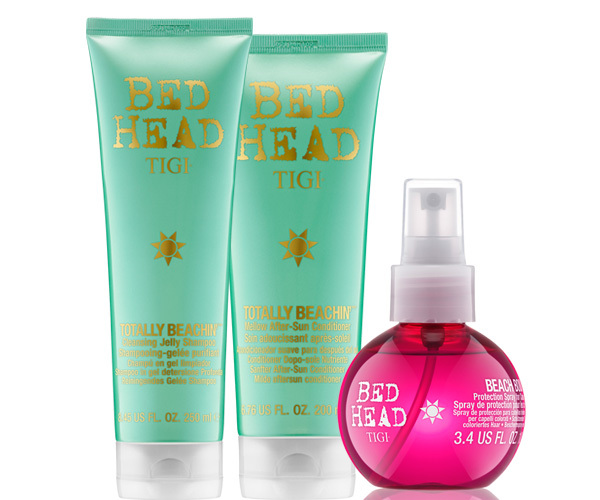 TIGI has also teamed up with one of my favorite designers for an insanely cool gift with purchase. 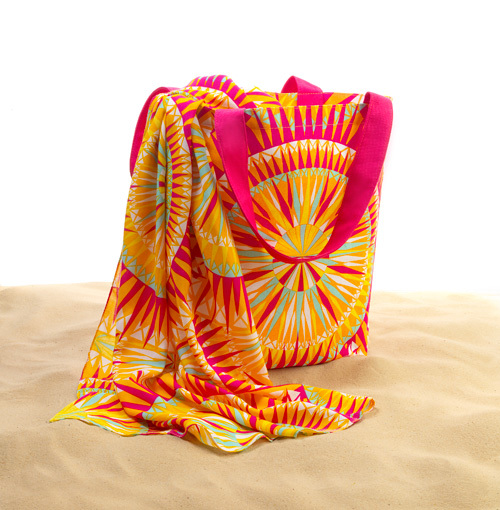 Mara Hoffman is the queen of beach wear and accessories, and she designed a psychedelic sarong and beach bag just for TIGI, using her signature starburst print. You can choose the bag or sarong as a free gift with your purchase of the Totally Beachin’ collection, available at salons nationwide from Memorial Day through Labor Day. How can you not freak out over free Mara Hoffman goodies? Run; don’t walk.